Strawberry Cake is a soft, moist teatime cake perfect to make when fresh strawberries are in the season. 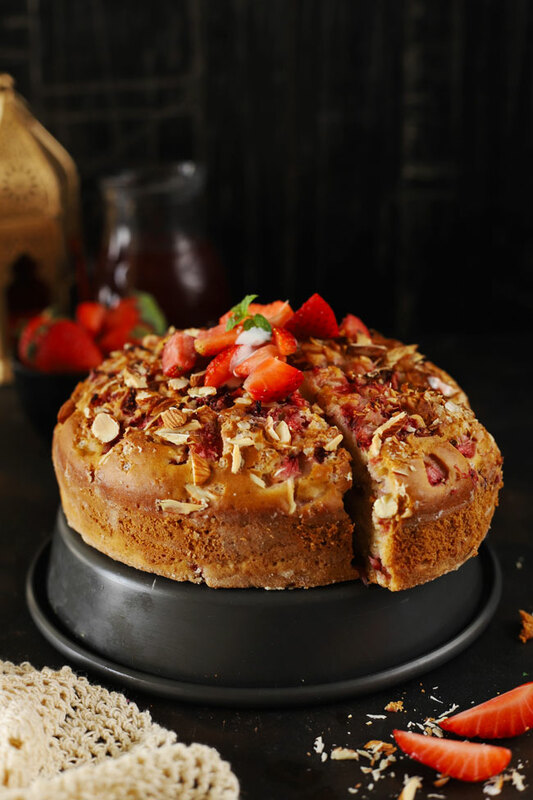 The tea-time strawberry cake has a delicate texture from inside and a brown, crusty uppermost layer. Strawberries add tanginess to the flavor, which along with the sugar creates an altogether divine taste. Serve strawberry cake with whipped cream and fresh strawberries; this combination will surely enhance the charm of your teatime menu. 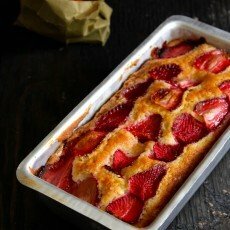 With plenty of fresh strawberries in the market, this teatime cake recipe is a great way to put them to use. The flavor of fresh strawberries has the right mix of sweetness and tartness. The skin of the berry may be particularly tart though it is juicy and goes exceptionally well in dessert recipes especially cakes. I have not used any fancy ingredients, just fresh and ripe strawberries, which are enough to get the desired taste and texture of the cake. You may think that sliced strawberries, layered on top would dry out while baking the cake but, the opposite is true. Heat causes the berries to soften and their juices to be released. So by the end of the baking time, they become wonderfully soft and jam-like with nicely caramelized edges. And the slightly caramelized layer on top of the cake the provides delicious taste and the crust. 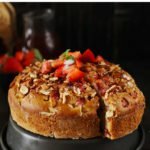 How To Make Best Strawberry Cake At Home? In case you not know, baking a cake of your dreams at home is not rocket science. If I have done it, you can do it as well. 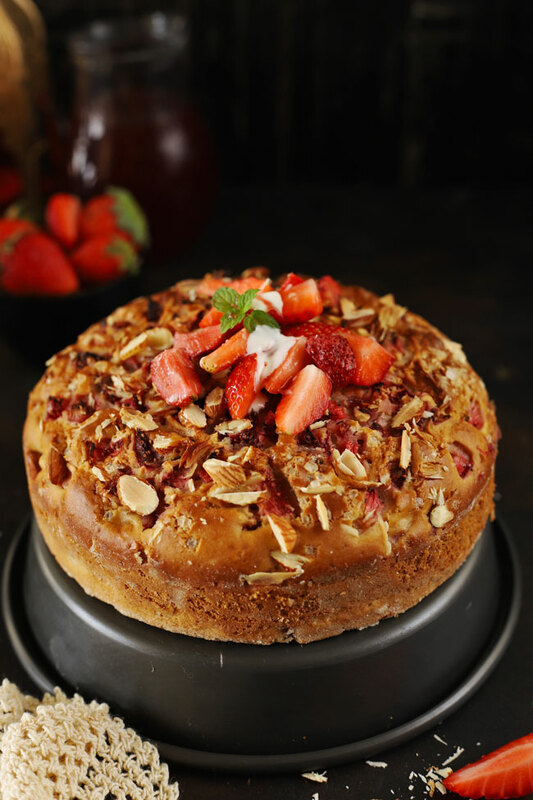 Just follow this strawberry cake recipe and keep these tips in mind while baking the cake. Make sure all the ingredients are at room temperature before preparing the batter. Else, cold ingredients straight from the fridge might affect the texture of the cake. Measure all the ingredients correctly. Baking is not at all about intuitions. We need to follow measurements strictly. Do not over mix the cake batter. Once everything is combined keep your hands away from the batter. Mixing for too long is not going to give you a soft cake. It does quite the opposite. Last but not least, over baking a cake is a serious crime (just joking). Always perform the toothpick test before deciding if the cake is ready. Usually, when I am baking cake in a microwave convection mode, I check it 5 minutes early then the suggested time in the recipe. And this trick always helps me to get the perfectly baked cake. 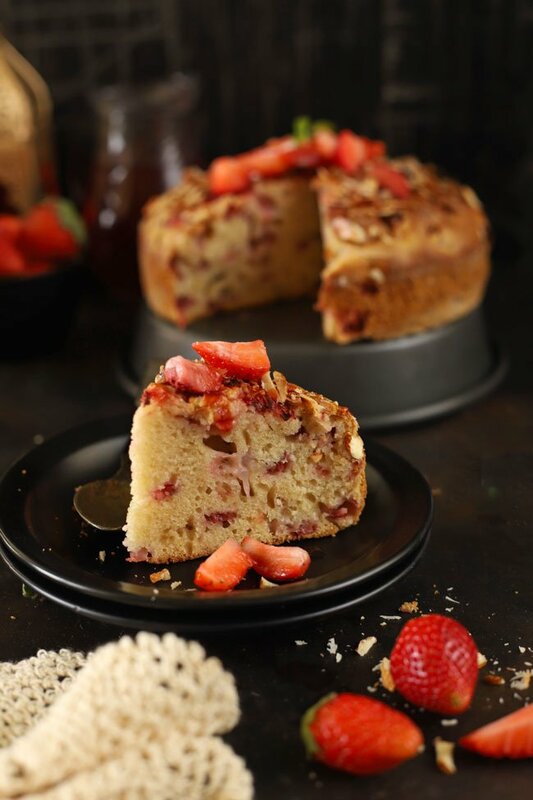 Strawberry Cake is a soft, moist cake perfect to make when fresh strawberries are in the season. 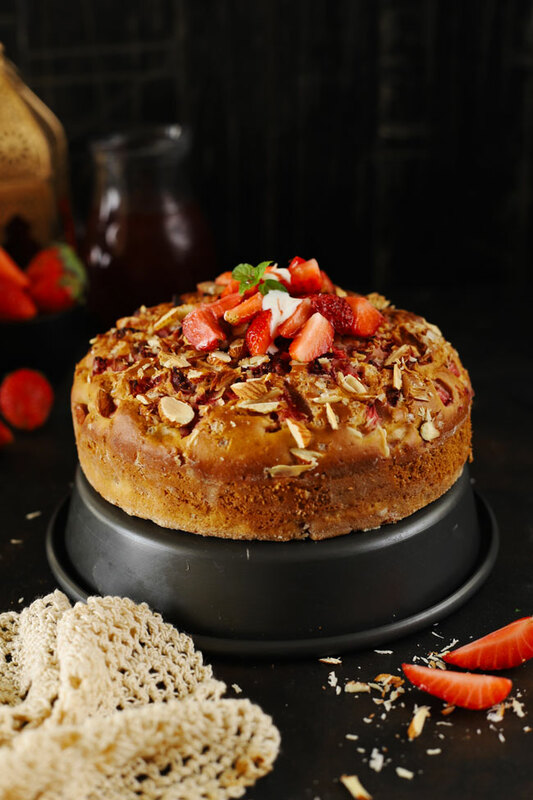 Learn how to make teatime strawberry cake recipe. Preheat oven to 350°F (180°C). Butter a 9-inch cake tin with little butter and line it with parchment paper. Whisk flour, baking powder and salt together in a small bowl. In a larger bowl, whisk butter and 1/2 Cup sugar until pale and fluffy with a hand mixer, about 3 – 4 minutes. Add egg, milk, and vanilla and whisk until just combined. Add sifted flour mixture in small batches, gently fold the batter until all ingredients combined well. Add half of the chopped strawberries and mix the cake batter nicely. Pour the batter in the greased pan. Arrange remaining strawberries and sliced almonds on top of batter. Sprinkle remaining 2 tablespoons sugar over berries. Bake cake for 50 minutes to 60 minutes or until a toothpick inserted in the center comes out clean. Let cool in the loaf pan over a wire rack. Cut into slice and serve Strawberry Cake with cream along with a cup of coffee. 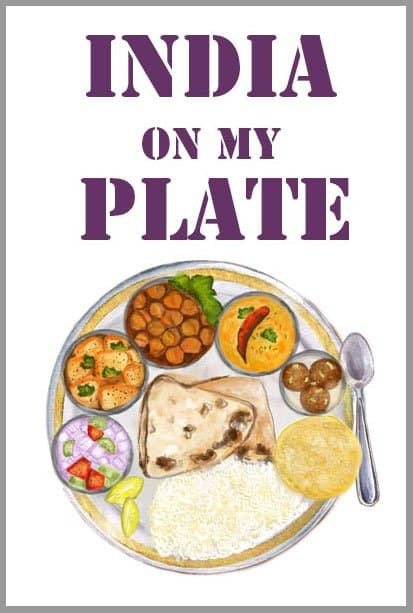 This blog has made me very hungry. I am a new follower. What would be the best substitute for the egg if I were to make a vegetarian version of the cake? I have never tried an eggless version of this cake. But you can substitute eggs with buttermilk or curd approximately 1/4 Cup. Hope this helps!